Monoclonal antibodies (mAbs) - large protein molecules produced by white blood cells (WBCs) that seek out and destroy harmful foreign substances - are finding wide application in many areas of medicine and biologic science. These antibodies have begun to replace conventional antibodies in blood banking and are used in the identification of organisms in the bacteriology laboratory. Monoclonal antibodies have also been extensively used in radioimmunoassay to measure serum levels of various substances. They have very useful in quantitating types of WBCs and subgroups of lymphocytes. They are also used in the diagnosis of leukemia. More recently, monoclonal antibodies have been used in the treatment of malignancies. They have been used to treat transplant rejection episodes, purge bone marrow of tumor cells in bone marrow transplants, and remove mature T cells that cause GVH disease in bone marrow transplants. There are several types of monoclonal antibodies on the market and in development. 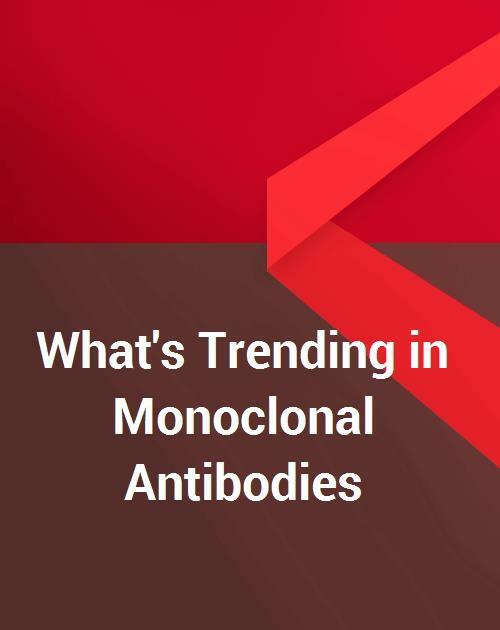 What's Trending in Monoclonal Antibodies (Markets by Structure, by Target, and by Indication) also looks at the market in terms of regional markets and the competitive situation. Developments in regional markets are a major driver for the monoclonal antibody market. The report provides an overview of these markets, going beyond the U.S. market to discuss the Europe market and rest of world market, which largely includes the Asia Pacific markets including Japan. Further, the report provides a competitor summary. It is no surprise that the early developers of monoclonal antibodies continue to be the leaders in the segment today. Some two decades ago, Abbott (with MedImmune), Johnson & Johnson (with Centocor) and Roche (with Genentech) launched three of today's leading mAb therapies. Information for this report was gathered using both primary and secondary research including comprehensive research of secondary sources such as company reports and literature; government documents and databases; research journals and reports; and general medical and business journals. A combination of primary and secondary research was used to determine market size for monoclonal antibodies by structure, target and indication. In instances where multiple indications are listed for one product the most common or used indication is listed. Billing databases and pricing charts were used as supplementary sources of information while interviews with key company representatives were conducted to verify initial findings. Primary research methods included telephone interviews and email correspondence with company representatives, researchers, government representatives, and physicians. These interviews were conducted with the purpose of capturing the perspectives from industry participants on the market opportunity and current trends. This was the basis of formulating forecast models and for confirming early findings related to market potential.